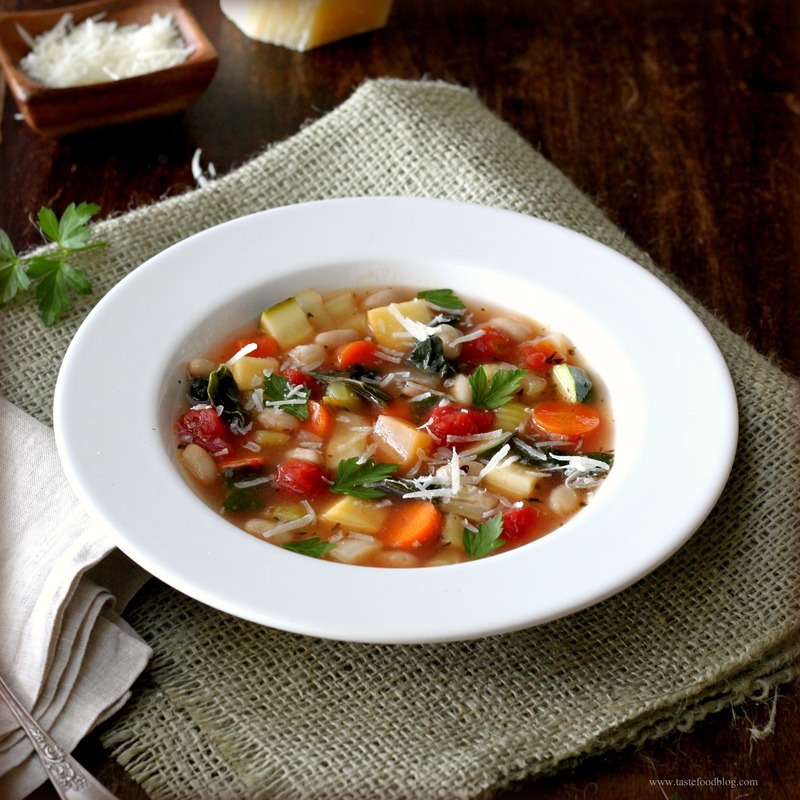 Minestrone is a classic Italian vegetable soup. What’s nice about minestrone is that there is no set recipe for it, except to use whatever vegetables you have on hand, which is my favorite way to make a soup. Often it contains beans and pasta, which when combined are an economical and efficient source of protein. Sometimes it’s more luxuriously embellished with meat. In this recipe I have the requisite beans but no pasta and no meat. Any embellishment comes from the chunk of Pecorino cheese I like to add for extra flavor and body. Finally, when I make a minestrone, I try to cut all of the vegetables in uniform dice. For some reason, I think this makes the soup taste better, perhaps because it’s easier to get a little bite of everything in each spoonful. Heat oil in a soup pot over medium heat. Add onion and sauté until beginning to soften, 2 minutes. Add carrots, celery, rutabaga, fennel and zucchini. Sauté until vegetables brighten in color and soften slightly, 3 minutes. Add stock, tomatoes, bay leaf, oregano, thyme, salt and pepper. If soup is too chunky, add more stock to desired consistency. Bring to a boil; reduce heat to a simmer and submerge cheese in soup. Cover and simmer until vegetables are tender, 2o minutes. Add beans and simmer an additional 10 minutes. Taste for seasoning. Add chard and simmer until chard is wilted, 2 minutes. Ladle into warm bowls. Garnish with grated cheese and parsley. A beautiful minestrone! Wonderful food for a deary January. I want to hire you to soup-photo lessons…Beautiful here. That looks so light and tasty too. I like cutting my vegetables for soup uniformly as well, I think it just looks better. I love the idea not not including meat, the beans should serve as a good portion of the protein, and it’s always good to skip meat on one day. Very nice photography. I don’t see the beans in the recipe. This looks beautiful! I can practically feel the warmth. Yum, I love minestrone. Glad to see you included fennel! This is my kind of soup! I love that you included fennel in it – and swiss chard. Planning on this for the weekend. I am curious as to whether or not the addition of fennel gave your minestrone any notable distinction, or did it just blend in with the lot after being boiled through. I love minestrone soup and yours looks just perfect! I’m feeling under the weather right now (and traveling to boot) and could really use a cup of this! I’ll have to make a big pot when I get home. This was my inspiration for lunch today and I’m eating it now, delicious, thank you!! The best kind of dish- simple and delicious! Love the addition of the Parmigiano rind for depth of flavor. Your minestrone looks so fresh and light. I especially like that you added fennel to the soup. I love a good minestrone and I totally agree; it’s great to experiment a bit with ingredients and flavors (and use whatever is in the fridge). I also like the below Italian minestrone soup recipe.